Recently, Asus have released a new range of motherboards based on the Intel P35 chipset. The P35 looks to be the successor to the excellent 965 chipset that has featured on the majority of C2D boards from the past year that have turned out to be excellent overclockers. It just so happens, that the P5K Deluxe WiFi (The replacement for the highly regarded P5B Deluxe WiFi) is also a monster overclocker, is rock solid, and yet can go even higher that the P5B Deluxe, so it looks set to be a popular board, and with that in mind, here is an add-on to the guide, to help the people that went straight to the P35 chipset, without having the benefit of using the 965 chipset first. Throughout this guide, I will be using a Q6600, which has a 9x multi. If your CPU has a different multi, please see the first part of the guide on how to work it out. OK, firstly, familiarise yourself with the BIOS. There are a few new settings to get your head round, but those of you who have come from a P5B series board, it should be pretty straight forward. All of the overclocking settings, including memory timings and voltages are all on the same page now, so that makes things easier. Open the BIOS and go to “Jumper free configuration”, and open that page. You will see the main page with all your overclocking settings. Some of them will be hidden at first, so you need to change a few things, so that you can see all the options. I've split the page into 2 images, as it wouldn't all fit on one. FSB Frequency – Stock is 266, we will change this later. PCI-E Frequency – I have had ZERO problems leaving this on AUTO, for even fairly high overclocks, on the P5B deluxe and the P5K deluxe using an X1900XT and an 8800GTX, but if you want to be safe, then manually set it to 100. The following settings are the RAM Sub timings Leave these at AUTO, unless you actually know what they are for your specific RAM and this board, because if you enter the wrong timings, your PC can become unstable, and we wouldn't want that would we? Transaction Booster = DISABLED* This is one of the new settings for the P5K. So far, I haven't been able to get any stability with this set to ENABLED, so, for now, disable it. If I find a use for this, I will add it here. CPU VOLTAGE = This is where you add/subtract extra Vcore if needed. CPU Voltage Reference = AUTO* This appears to have an effect on stability at higher overclocks, so you can keep it at AUTO, or if you are feeling confident later, you can set it manually. CPU Voltage Damper = Set this to ENABLED* Another new feature for the P5K, which almost eliminates Vdroop. Not everyone will need it, but I have found it handy when overclocking. 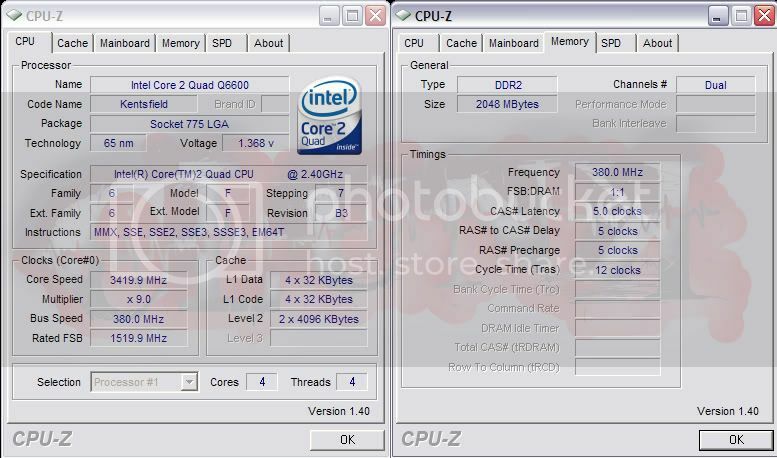 If you set a Vcore value in the BIOS, on past Asus boards, there has been a large difference between the voltage shown in the BIOS, and what you actually get, especially under load (Vdroop). This makes the Vdroop much less. Click here to find out more about Vdroop. FSB Termination Voltage = Leave at AUTO for now. North Bridge Voltage = Leave this at AUTO for now. Later on, when we use lower multis, and tighten the RAM timings, we may need to set this manually. North Bridge Voltage Reference = Another new setting for the P5K. Leave at AUTO for now, we can change this later if needed. South Bridge Voltage = Leave at AUTO for now. 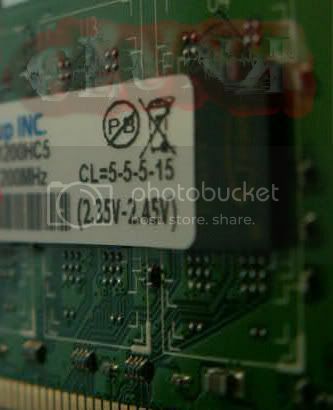 Look on the label on the sticks of RAM to find the correct timings and voltages. Have a look at the advanced CPU settings page. 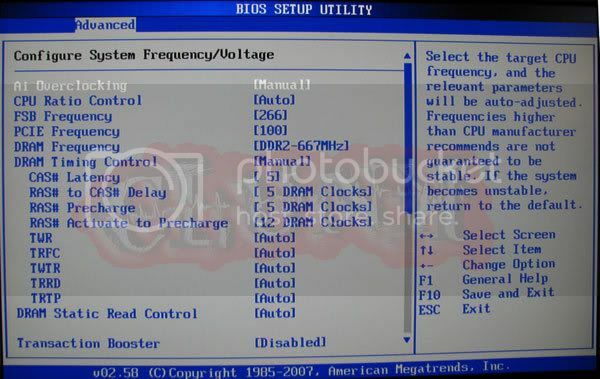 CPU Ratio Control – This just lets you choose the Multi, you can also do this on the main Jumperfree BIOS settings page. C1E Support – Disable this, it just isn't needed when overclocking. Max CPUID Limit – Disable this, its for older P4 CPUs with Hyperthreading, and older operating systems. Vanderpool Technology – Disable this, unless you specifically need it, find out if you do, by clicking here. CPU TM Function – Disable this. I can find no use for this with C2D, apparently it was to throttle older P4 Prescott CPUs. I have always disabled it on every C2D board with no problems whatsoever. Execute Disable Bit – I generally disable this, but it is up to you. If you experience instability with it enabled, try disabling it. You can find out more here. PECI – I usually disable this. I have tested this with several CPUs and have been unable to find any use for it. Enabled/Disabled doesn't affect my temps in any way, and no throttling occurs. If anyone knows any different, please let me know. 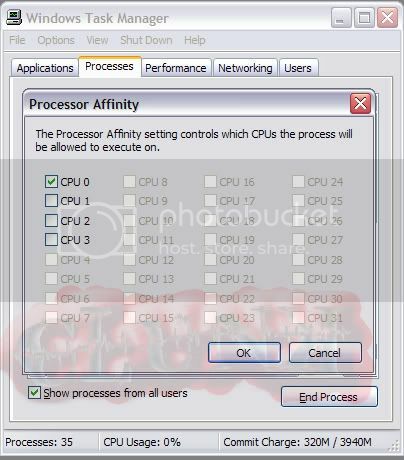 Intel ® SpeedStep (TM) Tech – Disable this, generally, it doesn't play nicely with overclocking. That's the important settings covered! Before we go any further, have you manually entered the correct RAM timings and voltages? If not, do it now. One of the most common problems with unstable/poor overclocks is because people haven't set the RAM timings and voltages properly. BAH! Last edited by Clunk; 14-12-2007 at 02:17 AM. Please have a read of the first part of the guide, if you haven't already. It will answer a lot of questions, and make your overclocking experience smoother, and hopefully more enjoyable. In this part of the guide onwards, I will assume that you have read and understood Part 1. Hopefully, now, you should now have an idea of what we are trying to achieve, and we can get down to business! I am going to be using the Asus P5K Deluxe WiFi AP for reference, a Q6600 and I will provide as many BIOS screen shots as possible, so you can easily see what I have done. 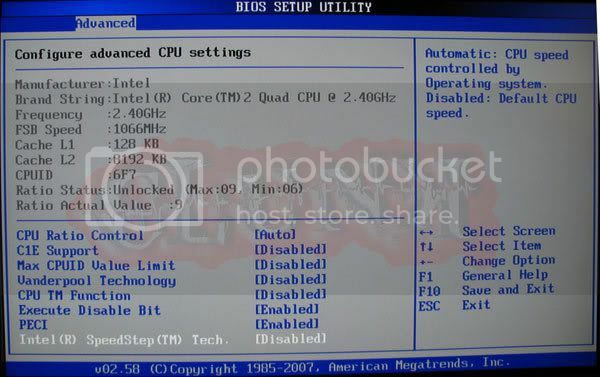 Ensure that you have the latest BIOS for your motherboard (311 at the time of writing this, available here. In pic below, you can see that we have manually entered the RAM timings and voltages. (I know I keep going on about this, but the amount of questions I get asked, that end up being fixed by this is incredible!). 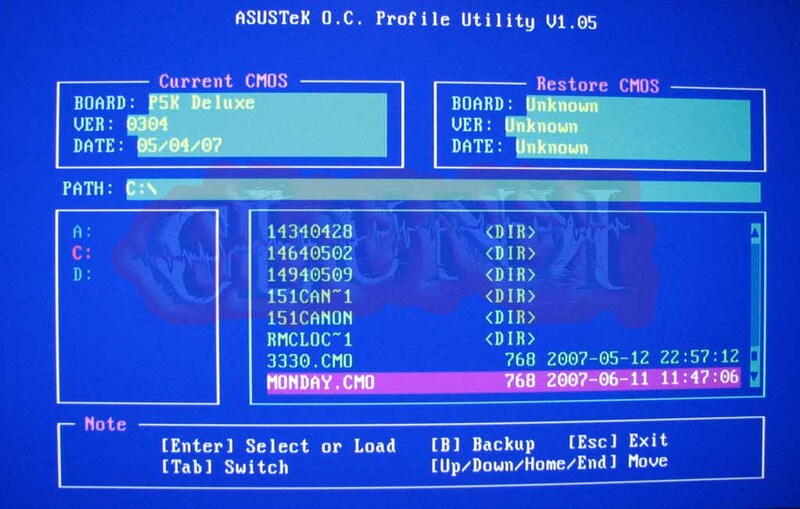 While we are in the BIOS, disable anything that you aren’t using, this part is optional, but I always do it. Things like on-board sound (if you have a sound card), Firewire (if you don’t need it), IDE controller (if you don’t have any IDE devices)….you get the idea anyway! If you have a separate PCI RAID card, and are experiencing problems with drive detection, try disabling legacy USB. Save all that, boot to windows, check everything is working OK and then back to the BIOS. Next, we are going to set the RAM at 1:1. At the moment, the P5K displays the 1:1 RAM settings incorrectly, which might be a bit confusing for some, so I will try and explain what is going on, and hopefully they will fix it with a BIOS update. Lets say that you want to have your FSB running at 266 and your RAM running 1:1, this would normally be shown as 533mhz for the RAM (on, say, a P5B etc.). A quick table to illustrate. Set the FSB to 333. The RAM will stay at 667mhz. Why? Have a look at the table above, this is fine. Set your CPU voltage to AUTO for now, later, we will come back and set it manually. 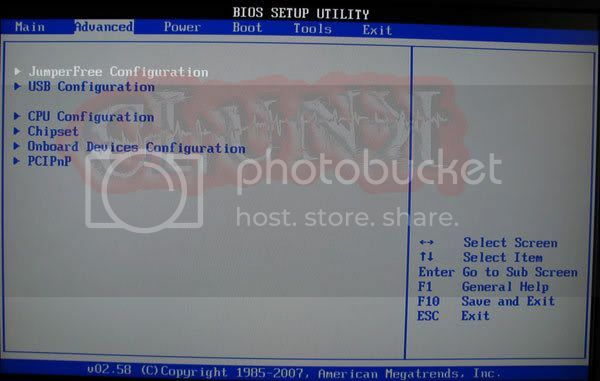 Save and exit the BIOS and let it boot to Windows. After you have finished marvelling, you can close CPU-Z, it was just to show you the changes that you have made. As in Part 1 of the guide, run a stress testing program such as Orthos/Prime/SP2004, or if you are using a quad CPU, and Orthos/Prime/SP2004 crashes, try 4x instances of SP2004 Just create 4x separate folders and run each of the exe files from the folders, and then set the affinity for each of them in windows Task Manager. Each instance of SP2004 should be assigned to a single core, in the pic below, you can see the first one assigned to core 0, the next one should be assigned to core 1 and so on. OCCT is a good stress test that will create a lot of heat, and stress all four cores, and can often give you a good idea if your overclock is going to be stable. Set Orthos/Prime/SP2004 going and read this next bit, and remember to keep an eye on those temps. I have seen a lot of people stressing about their temps recently, and there's really no need to. One thing to keep in mind is that pretty much every CPU reports temps differently, some report them MUCH higher than others, and there really isn't much that you can do about it. If you suspect that your CPU is running too hot, simply feel the heatsink while the CPU is under load, is it very hot? If it is, then you may have a problem, if it isn't, then you probably have a CPU that is reporting too high. If you have a quad core CPU, it will obviously run much hotter than a dual core CPU, and when overclocked, the temps can get quite high. My own Q6600 runs hot, and at stock speeds, using the stock cooler, it can hit 70c under load with ambient temps of around 23c. As you know, the stock coolers are no good for overclocking. Ask on the forums for advice on the best cooling for your needs. Use a good quality thermal paste like Arctic Silver 5, and follow the manufacturers instructions on how to apply it. Different CPUs require a different method of application. Properly secure your CPU heatsink. Make doubly sure that all the plastic lugs are pushed in as far as they will go, and then turned fully clockwise to lock them, otherwise, when you stand the case up, one or more of them will pull out. (see the troubleshooting guide for instructions on how to do this properly). Reduce cable clutter in your case. If your wiring is all over the place, this will restrict the airflow dramatically, and your temps will rise. I use 3 temp monitoring programs myself, and each have their own merits and drawbacks. If running a dual core CPU, I use TAT (Intel Thermal Analysis Tool), Coretemp and Asus PC Probe 2. I use Asus probe solely for keeping an eye on voltages, and the Northbridge temps, and TAT and Coretemp for the CPU temps. These work for me, however, some people can't get them to work. Vista seems to be a problem area for some temp software, and some boards, such as the 680i boards seem to be fussy about what they run as well. Be aware that if you use Speedfan to monitor your temps, your CPU temps will usually be around 15c too low, which could be dangerous if left unchecked, and for that reason, I don't recommend that you use it until they fix that. CPU-Z is a great little program for a lot of system info, but avoid using it for monitoring your CPU voltages when overclocking, as it incorrectly reports them. I'm running a Q6600 on this P5K, and I have found Coretemp to be the most reliable with this set-up I also use Asus probe, as I mentioned above, for voltages and Northbridge temps. Go back to the BIOS. Set to 380 FSB, the RAM will auto adjust to 760mhz (I'm assuming here, that you have RAM that is capable of at least 800mhz (DDR2-800/PC2-6400). Leave everything else as it is, and then save and exit the BIOS. All being well, Windows will load, and you can open CPU-Z. 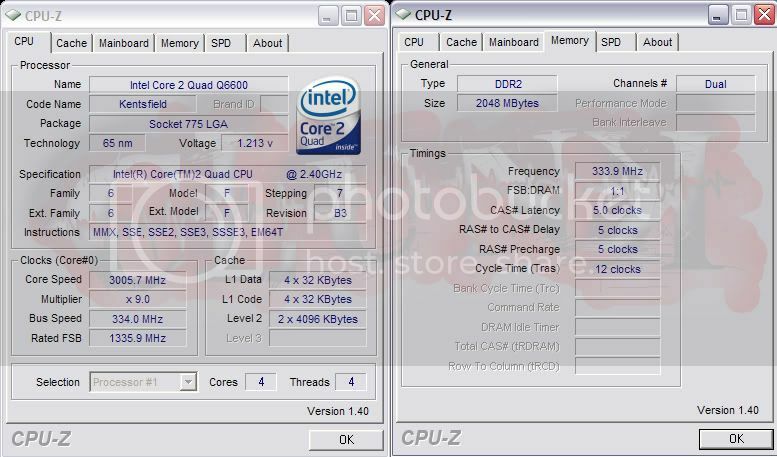 You should see something like this..
Also look at the RAM speed, it should be 780Mhz. As before, run Orthos/Prime/SP2004 for around 10-12 hours, if it passes with no errors and you are happy with the temps, then there's no reason why you cant try for higher, although for most people, even 3420Mhz is more than enough for most things, but, if like me, you have the bug, then go for it. 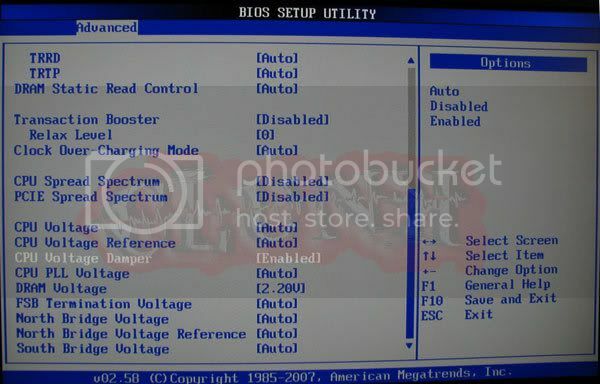 Boot to Windows, and make a note of the voltage displayed for your CPU in Asus probe, go back to the BIOS and manually enter one notch above that voltage, so if Asus probe says 1.4v, change it in the BIOS from AUTO to 1.4125v and test again, if it still fails, you can try another notch until it is stable, but keep an eye on those temps. Lower the FSB slightly, you can drop the FSB in increments of 10, and test with Orthos/Prime/SP2004 in between each step until stable. Last edited by Clunk; 29-09-2007 at 02:11 PM. In Part 2, we will be looking at tweaking voltages and tightening memory timings, and generally optimising your PC, now it is overclocked. At this point, as we are going a little bit more advanced, I will assume that you have read the other parts of the guide, and you have got to grips with how things work, and how to recover if you stuff it up (a bad overclock, see the troubleshooting guide). Please read this bit, it is very important! RAM is potentially the easiest thing to kill in a PC. Overvolting any component carries a high risk of damage and/or failure. I take no responsibility for any loss or damage to your components as a result of using this guide. All overclocking is done at your own risk. A lot of RAM, just will not overclock much, no matter how much voltage you feed it, so if things aren't working out for you in this part of the guide, leave it right there, and seek help on the forums, rather than throwing more voltage at it. Now you have a nice, stable, fairly large overclock, we can look at tightening the RAM timings. If your RAM is already running tight timings, such as 3-4-3-8, then there is no great need for you to follow this part, you can skip to the voltage tweaking part further down. If you have some RAM that uses Micron D9xxx chips (Check here to see if yours are), you will probably have more success at this point than people that aren't. The Micron D9 chips can often do really insane tight timings at quite high speeds, but often require a good slug of voltage to get there. Some sticks are rated for up to 2.45v, but for this kind of RAM, you need active cooling. Its pretty simple, the higher the voltage, the hotter the sticks will get, and the hotter they get, the more chance you have of getting errors, or even killing the RAM outright, so you need active cooling. By active cooling, I just mean a fan, directly blowing on the RAM to dissipate the heat that is generated. I have found that an 80mm or 92mm fan, blowing at a moderate speed from a couple of inches away, is enough to keep most D9 RAM happy (alive ), a 120mm fan has too big of a dead spot, in case you wondered. There are also dedicated RAM coolers that you can buy, from the likes of OCZ and Corsair, which also work well. My general rule of thumb is that if the RAM is 2.0v or over, blow a fan on it. Better safe than sorry. So, what I'm getting at, is keep the RAM cool. OK, back to the timings. Install Sisoft Sandra 2007. There is a very useful memory bandwidth benchmark in there. Run it now and make a note of your current memory bandwidth. This will often mean that if I were to run it at less than the rated 1066Mhz, say at 800Mhz, I could then tighten the timings, without having to up the voltage (not always, but more often than not). So, if I go into the BIOS, and look at my existing settings, I have an FSB of 380, and the RAM running at 760Mhz with timings of 5-5-5-12. Now, I know that the RAM will go higher at those timings, so in theory, can go tighter, at a lower MHz, so I will change the 5-5-5-12 timings to 4-4-4-12 and see what happens. Save and exit the BIOS. If it hangs or doesn't post, don't worry, it is just your Memory's way of telling you that it doesn't like going that fast, and that it needs more voltage (see disclaimer), or looser timings. If it boots to Windows, run the Sandra memory bandwidth benchmark and record your score again. Run Orthos/Prime/SP2004 again, if you get errors, you know its the RAM, so you will need to up the voltage by one notch. Save and exit, boot to windows, and test again. Is it stable this time? If not, repeat the above steps and add another notch of voltage to the RAM, but at this stage, if that doesn't work, its probably safe to say that your RAM doesn't overclock well, and to leave it at stock timings/voltages, rather than damage it. If it IS stable, then that is good news, run the Sandra 2007 memory bandwidth benchmark and record your scores. Now, if you are feeling adventurous, you can try for even tighter timings, maybe something like 4-4-4-4, or 3-4-4-8. Keep a note of all your scores, and if you have a bit of software that you use a lot, try out your new settings on that as well. At this point, it is just a case of finding out what your RAM is capable of, and if the performance is worth the trade off in heat and voltage. Next, we will see how high your RAM can go using a divider. If you haven't used a divider before on a C2D board, there isn't much to it really, on Intel chipsets, they only go upwards, in other words, they will only let you run your RAM faster than the CPU. While we have a play with these, we will put the FSB back to 266 for now, so I can explain things a bit easier. At 266 FSB, we have a set of dividers available to us. 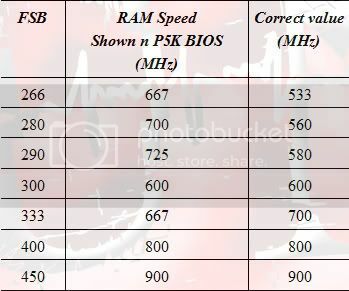 So, lets say that your RAM is rated at 800Mhz, choose the 800Mhz divider (it can be any within reason), and make sure that your RAM timings and voltages are set to their normal values. Try upping the FSB a bit to 300, this will now set the RAM to 720Mhz, and we know that your RAM can do at least 800Mhz, so lets go up a bit more, try 333 again (Deja Vu? ), this will give you bang on 800Mhz on the RAM, but only 3GHZ on the CPU, so we need to raise the FSB a bit more to say, 350, that gives us 840Mhz on the RAM and 3150Mhz on the CPU. Its not a huge overclock, but it is on the way. Save and exit, boot to Windows, exactly the same as before, if it boots, all is good, if it doesn't, you have gone too far, so either back off the FSB, or add a notch of voltage to the RAM (see disclaimer). OK, so we are safely into Windows, run Sandra 2007 memory bandwidth benchmark again and make a note of your results again. Run Orthos/Prime/SP2004 again, I like to use the blend test for all of these tests, so that everything gets a good stressing. Remember, this bit, is just an exercise to get you acquainted with dividers. Have a mess around with some of your regular programs again, see if you can notice any difference. Of course, it doesn't end there. For those of you with faster RAM, you can go back to the BIOS and choose a higher divider, and see how high you can go. Next up, we are going to try and find a good balance between your high CPU overclock, A high RAM divider and the tightest timings possible. 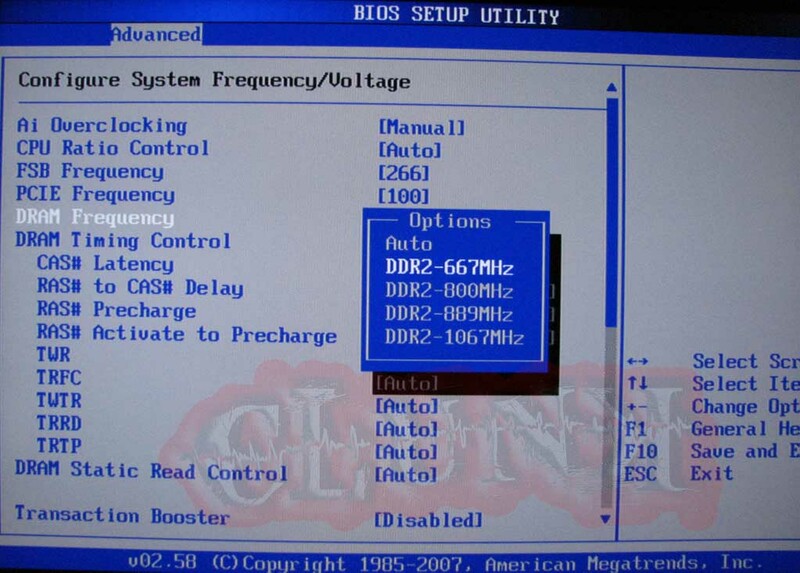 Load up your Best stable CPU overclock from O.C. Profile. Now choose a divider that is as close to your RAM's max as possible, but without going over. Keep the RAM timings standard for now. Set the RAM voltage to whatever you had it at when you found it's max speed. To aid stability, you can also change the Northbridge setting from AUTO to something like 1.55v. (This isn't always 100&#37; necessary, and you can always change it back later). A different divider, preferably lower, but sometimes a higher one will work. A notch more voltage to the Northbridge. A bit less FSB, try dropping it by 10 at a time. Once it's stable, you can try the tighter timings, but you may need to drop the FSB by say, 30-50 and work your way back up. All of this is just a balancing act, and, after a while you will definitely get a feel for what will and what wont work. Don't worry if something doesn't work, just keep experimenting, and you will get there eventually. This is pretty much, just common sense, and a process of elimination. So, your PC is rock solid stable, but there's an awful lot of hot air coming from the exhaust fan, what can you do? Anything voltage related that is set to AUTO, simply set it to its lowest value, manually. Do this one item at a time, test for stability, and then do another. That way, if you adjust a few things and it turns out to be unstable, you don't have to guess at what it was that you changed. Vcore is probably the biggest source of heat. Unfortunately, when you overclock, you will generate extra heat, even if you don't add extra voltage, but you can try and reduce the amount of Vcore that you use. Simply drop the Vcore to whatever you think, and then test with Orthos/Prime/SP2004, if it fails, it needs more Vcore, simple as that. Try upping the Vcore in single notches until stable again. You can always back off the FSB, but that kind of defeats the object of all the hard work we have just done. As always, if you think I have missed anything, or if you want to see something included in the guide, please let me know. Administrator message: Whilst the images for this thread have been hosted by HEXUS on this occasion we must advised that by following or acting on any of the information contained in this thread is entirely at your own risk. HEXUS Limited is in no way endorsing or recommending the content within this thread nor is it responsible for any loss or damaged caused, whatsoever. Speechless. Speechless I say!! Your timing is divine. Samsung 24" + LG 22"
Did you do these in Word or anything like that? What with the short time between massive posts. Anyway they are bloody good. good work - i did it very much like this and got good results. I didnt touch transaction booster setting but ive been quite stable - maybe i can go a little further with your help. its very important (i think you mention it in the first guide) that we are realistic about what we expect from our RAM - not all clocks very well, and so knowing which is D9 is good too. Awesome thread man. I'm having a blast clocking my P5K-dlx and temps are not bad at all. I just need to open up this old pc-601 with some 120 holes. You're a star clunk - i still haven't built my PC and it's like you... knew it..